A man who stabbed a stranger to death following a row over an electronic punchbag in a pub has been jailed for life. Daniel Baird, 26, was killed when a dispute between two groups of men spilled outside the Forge Tavern in Digbeth, Birmingham, on 8 July 2017. His mother said her family's lives "had been destroyed from the devastating loss" of her son. Killer Carlton Donaldson will serve at least 23 years in prison. 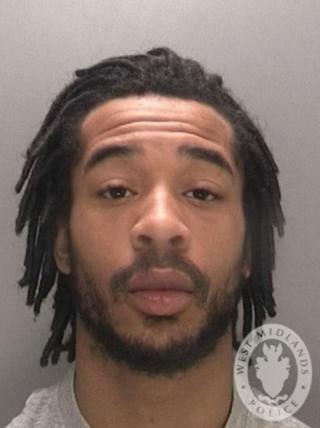 Donaldson, 24, of Minstead Road, Erdington, was also convicted at Birmingham Crown Court of wounding with intent, attempted wounding, violent disorder and possession of an offensive weapon. Sashon Brown, 25, of Woodington Road, Sutton Coldfield, who was found guilty of violent disorder and possessing an offensive weapon, was jailed for two-and-a-half years. Brown got into a dispute with Mr Baird's friend Dale Scott who took a swing at the pub's punchbag machine, the court was told. Pub CCTV footage showed Brown displaying a blade to Mr Scott. Donaldson later pursued Mr Scott and Mr Baird into Fazeley Street after the pub closed in the early hours and stabbed them. The wounded men were driven to hospital by a passing Google Maps operator. Mr Scott, 29, of Gilbertstone Avenue, South Yardley and Sean Spooner, 28, of Deelands Road, Rednal, were both cleared of possessing an offensive weapon and violent disorder. Det Ch Insp Ed Foster from West Midlands Police said: "The trigger for this murder was simply someone stumbling into another person. There was no bad blood between the two groups but that minor incident quickly escalated into a fatal fight." Speaking after sentencing, Mr Baird's mother Lynne said: "Our lives have been destroyed and we will never recover from the devastating loss of Dan. "We miss his beautiful smiling face, which brightened up our lives."